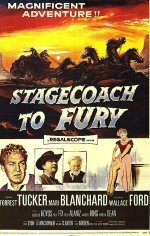 An interesting group of passengers on the Stagecoach To Fury get waylaid at a stagecoach station and taken as hostage. The bandits led by Rodolfo Hoyos are expecting a shipment of gold on the stage, but it isn't there. To save the others lives especially after Hoyos shoots and wounds driver Paul Fix, guard Forrest Tucker gives up the fact they're to meet the shipment at the station. So the bandits sit there and wait. And also kill a few useless passengers who try to make their own plans separate from Tucker and Fix.